Is it a scrapbook layout or . . . Many of the people that attended the GGAW last weekend were scrapbookers. It is always nice to get away, and be able to block out a large chunk of time to work on your scrapbook projects. These weekends are great for that. They are also great for getting a stack of cards made so you have some ready to send at a moments notice. I love to provide projects and inspiration to others at these events, and I love it even more when people use the supplies and their own creativity to make something new. This is the scrapbook layout I shared with the group. We used the beautiful Delightful Daisy DSP for background and the colour palette, and the Petal Pair TIEF and Petals & More Thinlits Dies for the embellishments. 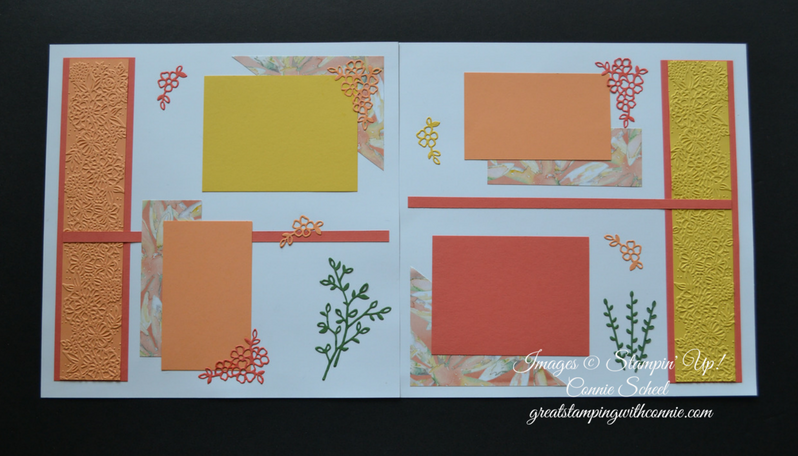 Using this for inspiration, Susanne decided to create her own cards. These cards are wonderful, and now she is ready to send a beautiful hand made card that is sure to tell someone they are special. Thanks for sharing and inspiring us Susanne!